If honesty mattered, Angola in southern Africa could have received top billing. Angola’s “acquaintance” with Europe and it’s American colonies, in the form of huge numbers of people kidnapped into slavery, was immense. Generations of forced labor living alongside their slaving masters made Europe’s plantation economy possible. Voltaire knew this. He also knew how much his contemporaries valued honesty. A mandarin’s daughter, Koong-se, fell in love with his accountant, Chang. A fence was built in the apple orchard near the willow to keep Chang out. A nobleman came by boat to marry the daughter. During the wedding party in the temple Koong-se escaped with her beloved Chang. The mandarin, the noble, and others ran across a bridge chasing them. The couple stayed in various safe houses until they were discovered and killed. The gods, feeling sorry for them, allowed them to live on as two doves flying around in the sky. Today, nobody cares (or even knows) about the star crossed lovers. Still the willow, the boat, the temple, the birds, etc., doggedly remain – even on cheap printed pottery from WalMart. A garbled tribute to the staying power of a quintessential blue and white pattern that once inspired poetry. …But any blather about “acquaintance” falls apart. What could be learned of China by looking at imagery invented by a guy named by Thomas Minton in Shropshire, England, in 1780 to sell his new line of porcelain? 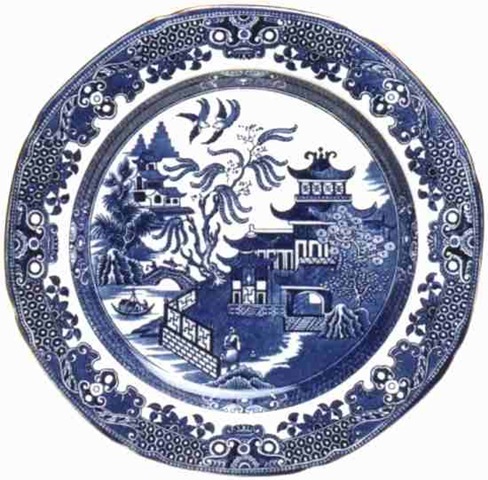 The sorry fact is that the Willow Pattern, like so many ingrained memories of commercials in our own youth, was basically a jingle that never went away. The Discovery of France. A Historical Geography from the Revolution to the First World War. Graham Robb. Norton & Co./New York. 2007. First this happened, then that happened, then the other thing happened. Then all that ended and something else happened… Not very meaningful, of course – unless you’re an outline junkie. But in the mid 1700’s something actually did happen. In England anyway. Super organized pottery factories burst on the scene. Spode. Minton. Wedgwood. Such names as these made the six towns collectively known as Stoke-on-Trent synonymous with exacting precision, a dizzying stylistic range and ruthless marketing – and large numbers of unskilled and child laborers. Staffordshire’s pottery firms radically changed the face of pottery. Within decades, they would practically dominate the world. The one run by Western Europe, at least. The days of small, family run country potteries were numbered. An entire way of life would soon disappear. You’d think these potters would riot. They didn’t. The new stuff rolling off the assembly lines hardly impacted (just yet) the need for “coarseware.” Staffordshire’s initial target was more up-scale. Like pewter. A picture paints a thousand words. Sometimes newspaper articles do too. The Story of Craft. The Craftsman’s Role in Society. Edward Lucie-Smith. Phaidon/Oxford. 1981. You are currently browsing the archives for the Minton category.